Born in Barmouth, Snowdonia’s most popular seaside resort, Sam’s family has saltwater running through its veins. Grandfather was in the merchant navy and a long-time coxswain of Barmouth lifeboat, earning himself a British Empire Medal for meritorious service to the RNLI. Father, a retired art teacher, also volunteered for the lifeboats, operated the Barmouth Ferry across the River Mawddach and ran a windsurfing and surf school on the beach – the same beach he was instrumental in earning a Blue Flag for as a town councillor. Meanwhile, Sam’s mother was an ironman fanatic and surfing professional who vied for the world championships. A Levels underway, Sam applied for university as well as attending the Admiralty Interview Board (AIB) – part of the officer selection process for the Royal Navy. He got offers for both but, with only a limited number of cadets accepted for officer training each year, he couldn’t turn the Navy down and went straight to work. CAPTURE ACTION SHOTS AND CNR STYLE IMAGES LADS ACTION MESSING, RELAXING BETWEEN SERIALS AS WELL AS ALL THE USUAL FIRE FIGHTING AND DAMAGE CONTROL STUFF. 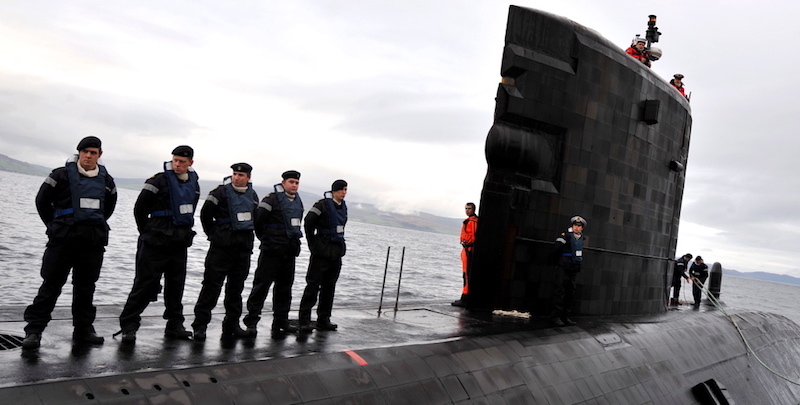 Final day of FOST (Flag Officer Sea Training) assesments.The Fost team arrived on HMS Sceptre after a boat transfer from Cambeltown.The serials included hydraulic bursts (Weapons Storage Compartment) and a Galley fire. 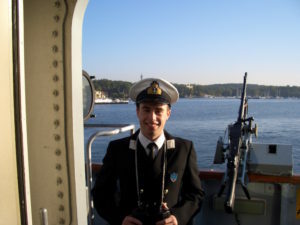 In 2010, as a newly-qualified Navigation Officer, Sam joined HMS Victorious, an enormous 150 metre 16,000 ton ballistic missile submarine (SSBN). Keen to see daylight, Sam moved land-based for his final job in the Royal Navy, deputy special operations officer at NATO Allied Maritime Command, Northwood – in a bunker. If you’ve ever watched 2015 British thriller Eye in the Sky, starring Helen Mirren, you’ll have an idea what Northwood is like. 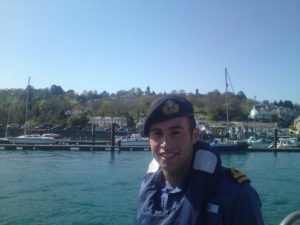 And, having spent all those years working in a sub, to be sent underground once more helped confirm Sam’s decision to leave the Royal Navy. Neither JP nor Sam had been to Mallorca but, in weighing up the dream of sunshine, beaches, palm trees and lifestyle, Palma won. They packed two cases, booked one night’s AirBnB, scooped up dog Toby and flew to Mallorca. Within two weeks they were both in gainful employment. 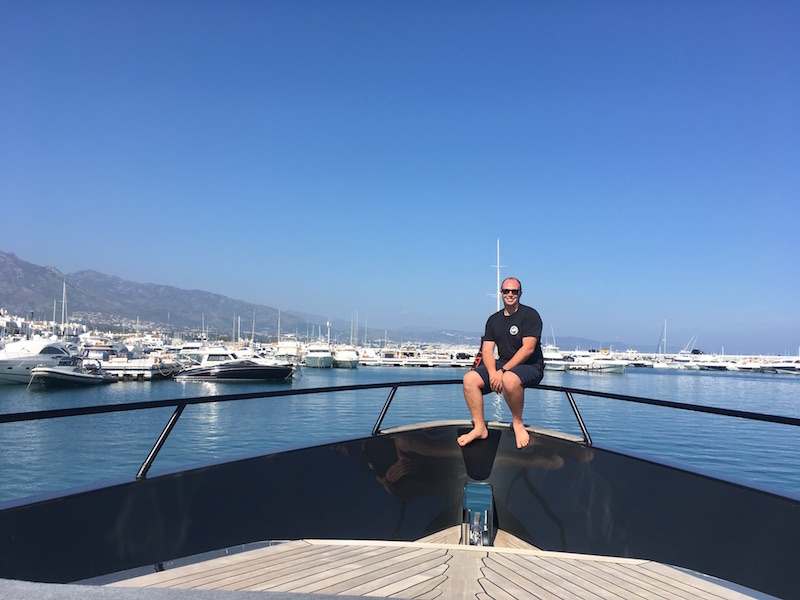 Sam jumped onboard the 62 metre motoryacht in October and spent the winter in the shipyard reliving his first year of basic officer training by polishing, painting and generally being the junior. He learned a lot, supported by a captain who wanted his crew to grow and further their careers. Sadly, for family reasons, Sam had to leave after just four months. El Bueno was a seasonal cruiser and, although Sam was invited to come back in summer 2016, he was offered captain on a larger boat – 21 metre Princess Minkie. 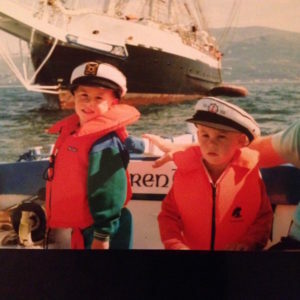 It was a South African family’s first boat and they quickly upgraded to Princess 82 La Vie, with Sam once more at the helm. 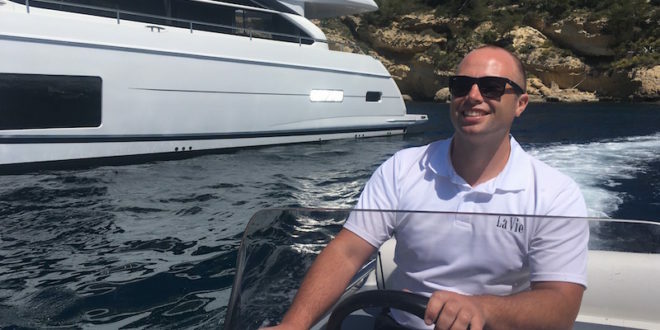 As summer drew to a close, Sam received a call to become captain on 120ft custom-built Palmer Johnson Ascari – it was impossible to turn down. As 2018 drew to a close, Sam realised he wanted his first time off in 14 years. 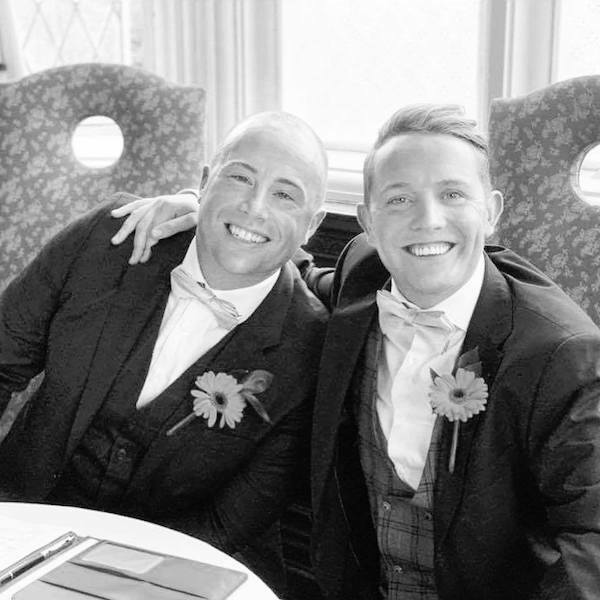 He did an end-of-season handover to a new captain and promptly got married to JP at the imposing grade I listed hotel Crewe Hall in Cheshire on 5 October. With JP bringing in the centimos at Aigua Sea School, Sam eyed six months of ‘relax’. Then the phone rang. 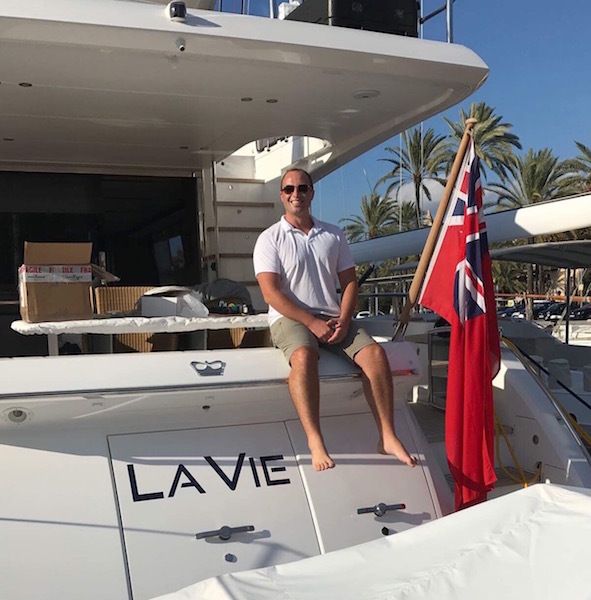 Sam and JP have hedged their bets and made a pre-Brexit property investment in Cheshire, with the plan to stay connected to their beloved Palma.